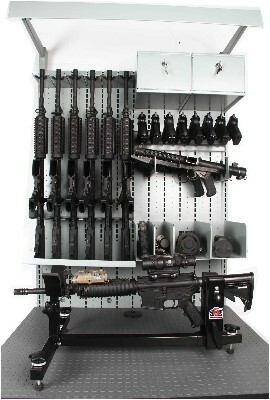 Armories require distinct storage for weapons and gear including the ability to perform weapons maintenance, cleaning and adjustments. 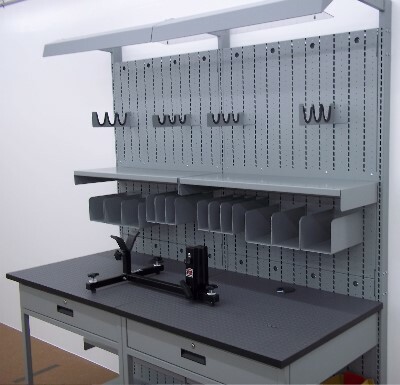 Combat Weapon Storage Systems recognizes the importance of space utilization with a line of modular workbenches and modular drawer storage for small parts, maintenance equipment and workspace within the armory. 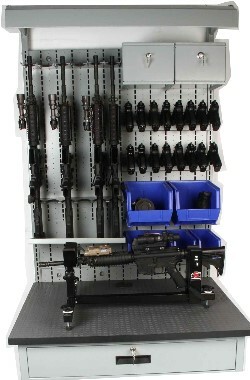 Our Combat Weapons Workbenches capture vertical space with a raised back panel and task light along with a secure storage compartment, electrical hook ups and modular drawer storage. Counter tops are available with high gauge steel or high pressure laminate surfaces based on end user preference. Shown below is our non-slip work surface. Modular drawer cabinets are available in a variety of heights with partitions and dividers available to create storage cells within drawers. 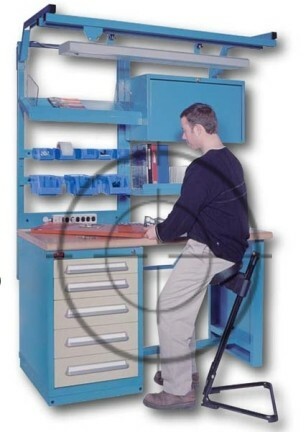 Modular drawer cabinets can be locked with a standard keyed plunger lock or with a pad-lock. 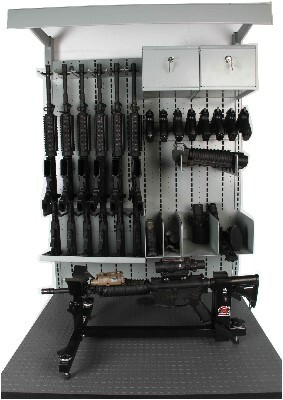 SOPMOD M4s stored with M9s NVGs in plastic bins and weapons vise. Lockable storage bins stored with M9s, M203s, NVGs and standard M4A1s.